We are happy to announce the launch of our new website. 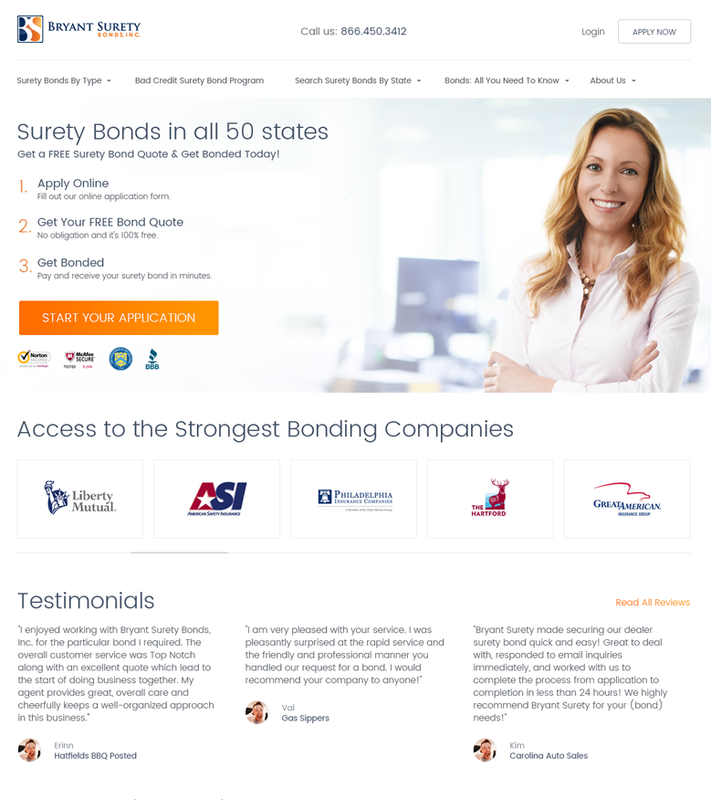 The redesign was done with you in mind, so we can provide you with a better experience and answer your surety bond needs in the best way possible. Scroll down to see what you can expect from it. We did a complete makeover of our website with our users in mind, by trying to be as helpful as possible during their stay. Whether you’re browsing on your computer, tablet or smartphone, it is now much faster and easier to find and navigate to the page and information you are looking for. 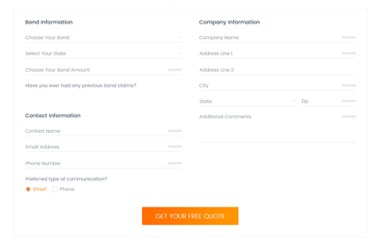 Regardless of the type of license bond you need, getting a FREE bond quote is now a breeze thanks to our new application form. It is much simpler to use and gets you from start to finish in just a few straightforward steps. You now have the option of providing ownership information directly, easing the whole process even more. You can give it a try. In just a few simple clicks, you can get a ballpark estimate of your bond premium and see for yourself that we really do provide the lowest bond rates. Have a go with it or simply navigate to our online application for an exact quote. If you have further questions, you can always give us a call or contact us online and we will be happy to help you. We realize surety bonds can be confusing. This is why we created the Surety Bond Education Center – a place where you can quickly search for the answers to your questions. But that’s not all. 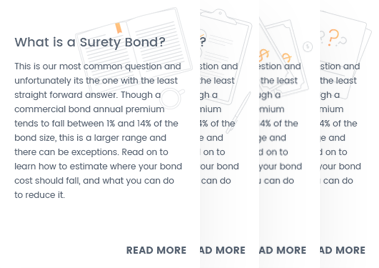 We also provide some insider tips and information to help you save money and gain more in-depth understanding of how surety bonds work. Not finding an answer to your question? You have the option to submit your own question and we’ll make sure to answer it as quickly as possible. Struggling to keep on top of all the surety bond updates and requirements pertaining to your industry? 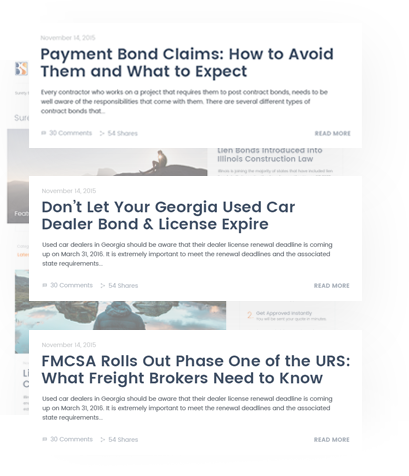 Follow our redesigned blog where we post all kinds of useful articles, such as the latest legislative surety bond updates, helpful bonding and licensing guides, and much more, so you are always up-to-date with the bond requirements that matter to your business. 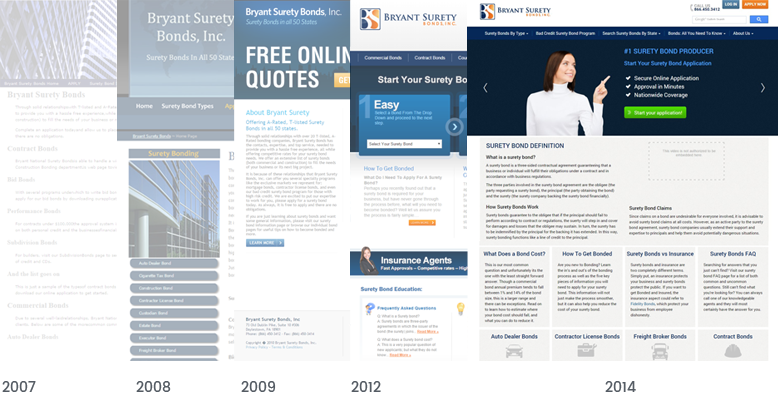 To see that we are serious about the look of our website and the experience it provides, here is an opportunity to take a peek at how we’ve evolved throughout the years.